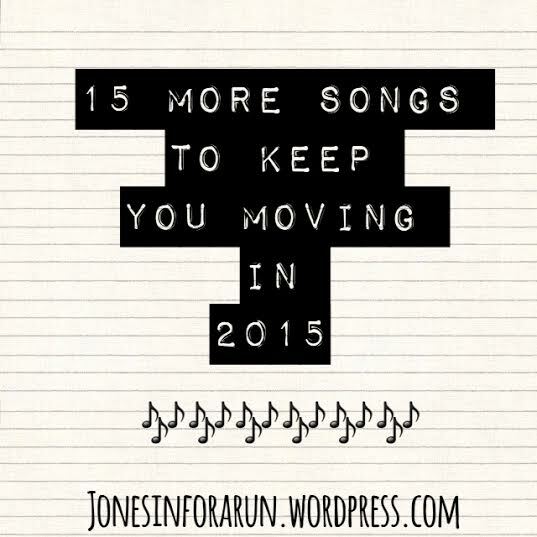 15 MORE songs to get your moving in 2015! So my sister’s playlist was heavy on the pop – so I tried to take mine in a different direction. Here is the list of the songs I am loving right now. Beggin for Thread – Banks. The steady rhythm gets me going and I really have to stop myself from singing along while on the treadmill at the gym. When I run outside, yes, I sing this song probably louder than I should. Good thing it’s the middle of winter and all the passing cars have their windows up. Outside (feat. Ellie Goulding) – Calvin Harris. This song has been a staple of my cycle fusion classes for a few months. I have had previous posts declaring my love for Ellie, so I won’t rehash that, but know this song is catchy, great beat, and contains a wonderful section for sprints! Loyal (East Coast Version) (Feat. Lil Wayne & French Montana) – Chris Brown. There’s just something about songs featuring Lil Wayne that get me hyped. Lil Wayne combined with Chris Brown AND French Montana, now that’s just perfection. Perfect song for a steady treadmill run. Plus, I can’t think about French Montana without having a Kardashian pop into my mind. Which then leads me to push myself to be a hot mom like Kourtney & Kim. I ain’t hating. Shut up and Dance – Walk the Moon. Nothing like a little Power Pop Song to get you through your workout.Another regular jam in my cycle fusion class. Believer (Teisto Remix) – American Authors.While I like the original of this song, I LOVE the Teisto remix. Built in segments for sprints! When you hear this song, you will know when to push yourself. Dreams – The Cranberries. I am taking it back to my high school days with this one. I dare you to name one person who was born between 1980-1985 who doesn’t like the Cranberries. That’s right, you can’t. That person doesn’t exist. Boom. Anna Molly – Incubus.A high intensity song that people love. If this doesn’t get you going – I don’t know what will. I played this song in my cycle fusion class Sunday and someone requested that I turn my already pretty loud music up. Now that is the sign of a good instructor who can pick great music. I just patted myself on the bank. More Human Than Human – White Zombie. Put on that bandana, things just got crazy weird in here. A little Rob Zombie creation, he is good for more than just scary movies. Hit the Lights (Feat. Lil Wayne) – Jay Sean.Featuring Lil Wayne, enough said. Tell ‘Em – Sleigh Bells. This song has such an interesting sound. I can’t get enough of it. Once you hear it, you will understand why. Celebration Song – Unwritten Law. An oldie, but a goodie. Download it now. You will thank me later. Judas (R3HAB Remix) – Lady Gaga. It’s a power song in my cycling class and it should be a power song in your life. You Make the Rain Fall – Kevin Rudolf. Whatever happened to Kevin Rudolf? One hit wonder and then he disappeared? Well good thing he left us with this little jammy jam before he did. Flashed Junk Mind – Milky Chance.A great cool down song.Something different than my normal cool down playlist which runs deep filled with the likes of John Legend and Justin Timberlake. So now that you have 31 songs to get you moving you have NO MORE EXCUSES! Make that playlist and get out there and get moving! Next Post New Blog Series: HOT MOM CHECK-IN!